Concerns that taxi drivers from outside Leeds could work in the city and avoid a proposed clean air charge have been raised at a council meeting. The city’s clean air charging zone (CAZ), which is due to come into force in January 2020, would see high-emission taxis and private hire vehicles registered in the city paying £50 a week. Cars used by members of the public would be exempt from the charges. Could taxis enter Leeds City Centre without paying the CAZ charge? It is hoped that this will encourage taxi drivers to invest in lower-emission hybrid or electric vehicles and help improve air quality in the city. But members of the Leeds licensing committee are worried that taxis registered elsewhere could work in the city for free. Coun Neil Buckley (Con) asked: “If the CAZ came in tomorrow, any private hire vehicle could arrive in the city, drive through the zone and appear as a private car. 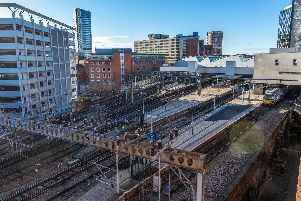 Leeds City Council deputy leader James Lewis (LAB) responded: “We are one of the five cities the government has instructed to introduce a CAZ. “For the government’s policy to work, the onus is on them to produce a (national) database of taxi and private hire vehicles so each city has access to that information. We are putting all the pressure we can on the government to make sure that is in place by January 2020. A council officer said a working group would be set up with other West Yorkshire authorities and York. He said assurances had been given by the government that a national taxi licensing database would be available by 2020.